This new novel in the “wonderfully absorbing” (Library Journal) Secrets of the Tudor Court series, features a tailor’s daughter who suspects she is an illegitimate offspring of King Henry VIII. Audrey Malte is illegitimate, though her beloved father—tailor to King Henry VIII—prefers to call her “merry-begot,” saying there was much joy in her making. Then Audrey visits the royal court with her father, and the whispers start about Audrey’s distinctive Tudor-red hair and the kindness that the king shows her. Did dashing Henry perhaps ask Malte to raise a royal love child? The king’s favor, however, brings Audrey constraint as well as opportunity. Though she holds tender feelings for her handsome music tutor, John Harington, the king is pressuring her to marry into the family of treacherous, land-hungry Sir Richard Southwell. Audrey determines to learn the truth about her birth at last. The answer may give her the freedom to give her heart as she chooses . . . or it could ensnare her deeper in an enemy’s ruthless scheme. 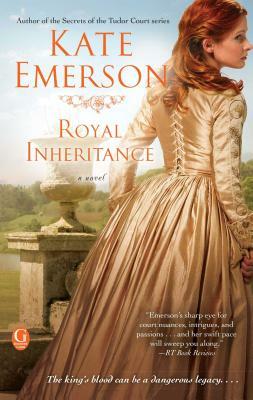 "Imagining the life story of Audrey Malte, an actual historical figure, [Emerson] reliably mixes court intrigue and the complicated politics of Henry’s life and multiple wives with the fascinating private journey of a young woman who gradually becomes aware of her royal heritage...Another satisfying, page-turning addition to Emerson’s series." "An engaging tale of loyalty, love, and treachery in the court of King Henry VIII." "Intrigue, romance and treachery abound in this well-researched, sensitively written book." "In the first in Emerson's series, it's hard to tell where reality ends and fiction begins. Rich and lushly detailed, teeming with passion and intrigue, this is a novel in which you can happily immerse yourself in another time and place." "It is this heroine that separates this book from the pack. The characters are subtle and well-drawn.."